Books by Daniel J. Wiener, Ph.D.
by Daniel J. Wiener, Ph.D.
Edited by Daniel J. Wiener, Ph.D. Sometimes clients need more than just words to help them change and heal. When traditional “talk therapy” falls short, therapists can turn to action-centered methods that go beyond words, allowing clients to express emotions more freely and often leading to newer and deeper insights. These techniques might include art, dance, yoga, drama, or ritual. Beyond Talk Therapy is a comprehensive guide to expressive techniques: each of its 13 chapters focuses on a different approach, describes its theoretical underpinnings, and summarizes research on its effectiveness. Two distinctive features are: (1) two case examples, one more advanced; and (2) a two-column format juxtaposing case narrative with the clinician’s commentary. A companion volume to Beyond Talk Therapy, this book features three in-depth chapters on Family and five on Group therapy that illustrate how a variety of action methods were central to the conduct of the therapy in each case. Cases studies were chosen to represent the broad spectrum of client compositions encountered in family and group treatment: three-generational family systems; intact and blended (step-) nuclear families; multiple family groups; and theme-centered groups with a diversity of populations and presenting problems. The featured clients are diverse with respect to psychosocial functioning, therapeutic setting, and economic resources. While the client population treated in each of the cases is specific, many of the action methods described may be applied to conjoint psychotherapy across a broad range of populations. All chapters give a theoretical orientation and detailed rationale concerning the choice of method at that point in the case. Since Rehearsals for Growth: Theater improvisation for Psychotherapists was published in 1994, there have been a number of significant developments: the introduction of the Dramaturgic Model; the development of eight RfG techniques for interpersonal relationship assessment; training of other RfG practitioners and trainers; and a broadened application of RfG to other populations. Numerous RfG workshops have been offered to the public and to therapists at over 200 professional conferences in eight countries. To date, more than 2500 clinicians have attended RfG workshops. This volume contains 24 outstanding published papers, as well as one chapter in press and three unpublished papers written on RfG through 2004. These works were compiled in order to provide convenient access to RfG scholarship. This volume is available as a digital download only on this website. PDF 271 Pages. Cost: $40 (USD). Cost: $45 (USD) Includes USPS shipping cost. 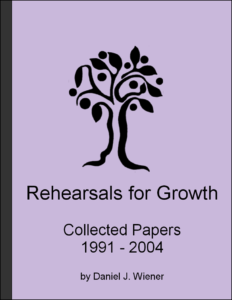 This successor to Rehearsals for Growth: Collected Papers, 1991-2004, this volume was compiled to provide convenient access to RfG scholarship published during the subsequent twelve years. During that time, RfG has become recognized as a Drama Therapy of Relationships by the North American Drama Therapy Association; the RfG website has been expanded to include video clips and a Clinician’s Corner featuring case vignettes from RfG Certified Practitioners other than Daniel Wiener; The Certificate Program for Practitioners has been undergone a major revision; A new Certificate Program for Trainers has been developed; and a 102-minute DVD, Rehearsals! for Growth: Couples Therapy was produced. Volume II contains: 17 published works written or co-authored by Daniel Wiener; 5 Case Vignettes from RfG-CP’s; The complete transcript of the above-mentioned DVD; an Appendix listing RfG-themed professional workshops from 1983 to 2016; and a preamble from the RfG Certified Trainer Handbook recounting lessons derived from 32 years of training therapists in RfG. This volume is available as a digital download only on this website. PDF 302 pgs. Cost: $40 (USD). Edited by Adam Blatner, with Daniel J. Wiener, Ph.D. Dramatic activity encompasses more than professionally staged and scripted performance. Increasingly, forms of applied theatre dramatic activity are proliferating. The thirty-two chapters of this book span the creativity, utility and vitality of applied theatre in contemporary life and are grouped into five sections: education, therapy, recreation, community-building and personal empowerment.